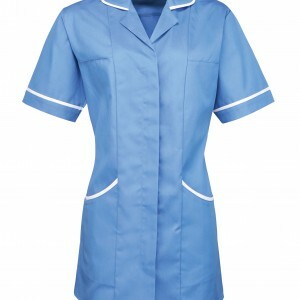 Healthcare tunic in easycare fabric. Rounded collar styling with contrast piped edge. Covered front zip fastening. Popper fastening above zip. Curved side pockets with contrast piped edge – 2 PU lined pen pockets. Side and back pleats for fitted styling. Contrast piped detail on sleeve cuff. Side slits. Made from Oeko-Tex® Standard 100 fabric.